New prices and taxes from December 21st, 2017. For applicable taxes, please see list. Gift Certificates available: $25, $50, $75 and $100 denominations. Please call or email. Cyclists are always welcome—drop by for a refreshing drink, local information, or to spend the night. Check in time is 4pm. Check out time is 11am on the day of departure. Day use of UTC's shared areas is charged at $5 + taxes per person. Early check-ins / late check-outs by prior arrangement only. 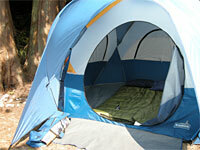 Up The Creek now has five accommodation options. Our in-house dorm beds have been hand made from locally milled wood, and are standard single size beds, with firm top quality foam mattresses. 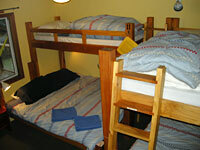 Most are single bottom beds, although two beds in each room are top bunks with ladder access and safety railings. 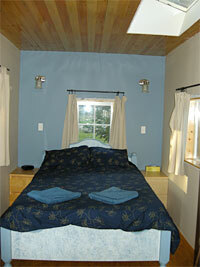 Within the Fir room, the bed is made of the same materials, with a Queen sized bottom bed and a single bunk above. Individual beds cannot be purchased in the Fir Room. 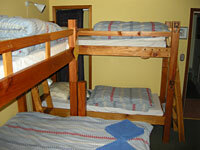 Our newly furnished Cedar Family Room has a Queen sized bottom bed and three additional single bunks (two top bunks). This room may also be arranged with 5 single beds. 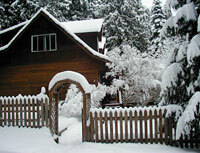 The Cherry Cabin, located 75' from the main house, sleeps two people in a double bed. This small cabin is cosy and private, with fine views over the garden, and has three windows and a skylight for lots of natural light. The cabin is heated with an electric wood-lookalike stove, has a wash hand basin, a fitted closet, night tables, a wrap-around deck and hammock. 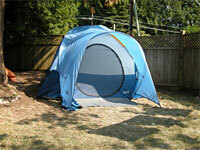 It does not have a washroom, and can only sleep two people max! 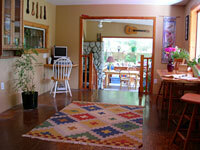 The Cherry Cabin is our only Pet Friendly space. Small pets can be accommodated for a $10 surcharge. Responsible use and clean-up of the garden is also expected. All beds are provided with a top and bottom sheet, two pillows, and an IKEA Mysa Mane synthetic quilt and quilt cover. Tent sites are limited to 3 locations, $15 + taxes per person, ONLY when all inside backpacker accommodation is taken, and ONLY for travellers arriving by bus or bike. NO exceptions. Two UTC tents, complete with foamies, sleeping bags, liners, pillows, pillow cases and flashlights are also available for rent — $28 + taxes per person, max 2 persons per tent. Up The Creek will endeavor to respect traveller's wishes regarding sleeping arrangements, but please note that Dorm beds may be co-ed. Small motorhome use is permitted with electric hook up only (no water or waste) for $28 + taxes per night, maximum two persons & limited to one vehicle only. Up The Creek is available for group bookings where the complete building can be rented for exclusive use. 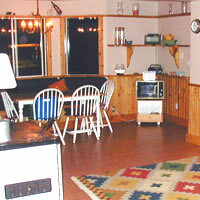 The property can accommodate up to 17 individuals in three rooms and one cabin, and is charged out at $500 + taxes per night, excluding an additional maximum 10 persons in rental tents and using tent space (summer only). Groups wishing to use the common areas of the property for daytime meetings, seminars, meditation, yoga, etc may do so with the additional charge of $75 + taxes per day. Group bookings are payable two weeks in advance, and require a 25% non-refundable deposit upon booking. Up The Creek reserve the right to charge an extra $5 per person on all group bookings, which will cover the cost of making beds on the first night's stay. This only applies to the 7 bed Arbutus Room and 5 bed Cedar room. Throughout the year, Up The Creek often have special rates that will often appear on our homepage or appear in our bi-monthly email newsletter. 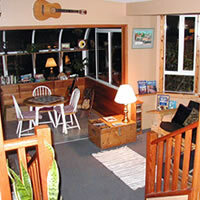 Annual promotions include accommodation for April Fools runners, and the Suncoaster mountain bike race, and special deals for musicians playing in Roberts Creek. This year's "After the Long Weekend" specials are: Feb 13-15, Sept 11-13 & Oct 16-18. Enjoy a second weekend night (Friday or Sunday) for half price. 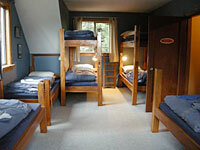 So, two dorm bed nights for just $42 + taxes pp, or the private room/cabin for just $120 + taxes. Our "Family & Friends" discount is designed to give the people closest to us a great deal on their holiday, yet allow us to remain in business. If you come at our invitation, your accommodation is likely to be free. But if you're looking for a deal, please don't hesitate to ask, we often give between 10–25% discount. 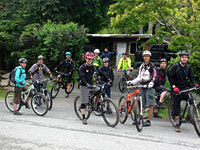 At certain times during the year, special events in Roberts Creek mean that UTC is often sold out to one large group who have private use of the property. This is sometimes the case during the height of summer when numerous weddings are held in the vicinity, and guests fill up the lodge. It's also likely during the week of the Sunshine Coast School of Celtic Music, which this year will be Mon July 6 – Fri July 10, 2015.
Credit cards (MasterCard and Visa, no Amex), Interac, travellers Cheques and Canadian $$ cash only accepted. ID required. A credit card is needed to reserve your space but will not be debited until arrival (except group bookings). Please have the card with you or any other preferred method of payment. Bookings are preferred by telephone. Enquiries may also be made by text. However, reservations can be made at Up The Creek through our secure online server. To make an online reservation request, please complete the reservation request form below. Within 24 hours, Up The Creek will notify you via e-mail with confirmation of your reservation. Direct online reservations can now be made for private rooms, cabin and dorm room beds by clicking here, only when there is a minimum 48 hours notice. 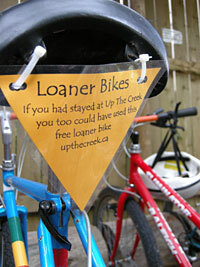 Up The Creek employs a maximum 5 nights stay, unless on local educational course, or under special circumstances. 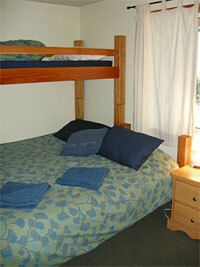 Depending upon needs, we also offer free bed space in return for casual work after a minimum of 3 paid nights. Long weekend bookings require a 2-night reservation. 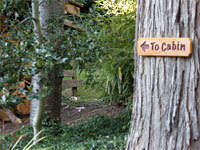 A one week cancellation policy applies to all bookings of the Fir room and Cherry cabin during July and August only. Outside of this period, a 48 hour cancellation policy exists for all bookings other than Group bookings (see below). Cancellations received 48 hours or more before the check-in time (4pm) of the booked date will not be charged, i.e. to cancel Thursday night you need to call by Tuesday 4pm. This also applies to multi-night bookings. Cancellations after this period will be charged in full. We will however make every attempt to re-let your space, in which case you will be refunded for the unused accommodation, less 15% administration costs. Bookings of more than 1 room are considered group bookings and are subject to a 14-day cancellation policy, and incur a 25% administration charge where we are able to re-let. 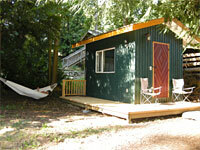 Pets allowed in Cherry Cabin ($10 surcharge) & outside only. Lost and Found Service. All items left at Up The Creek will be kept for 3 months only. Items mailed will cost $10 admin fee + postage & packing.